Numerous folks have served on the ARC board and contributed to ARC’s mission including founders Lee Barnes, Peter Bane, Pamela Corcoran; and members or former members, Ann Kreilkamp, Kristin Griffins, Andrew “Goodheart” Brown, and Rhonda Baird. The non-profit Association for Regenerative Culture (ARC) was founded in mid-2005 in response to a recognized need for regional permaculture education, networking, and demonstration support and promotion. ARC chose to focus on the Eastern US Woodland Forest areas from Florida north to Southern Canada and west to the Mississippi River. The intent was to unite bioregional regeneration with permacullture ethics and practical, regional solutions to food, fiber, fuel, and social needs. Co-Founders Lee Barnes (Ph.D., PDC ’92, Land Stewardship Consulting), Peter Bane (longtime PC teacher and former Publisher of The Permaculture Activist–now Permaculture Design), and non-profit consultant Pamela Corcoran (Synergetics) saw the need for an organization to 1) support Permaculture teachers and increase the network of teachers and PDC courses; 2) work to better network students, train and support new teachers, and promote emerging local Permaculture Guilds and Regional Centers; and 3) to begin developing a widely located series of publicly accessible permaculture and alternative demonstration and teaching sites. After several organizational meetings, mission statements and by-laws were developed and ARC began sponsoring a series of full 72-hour Permaculture Design Courses (PDCs) in central Virginia in 2006. ARC was accepted as a North Carolina non-profit in fall of 2006 and as a Federal charitable 501 (c) 3. Foundation in May of 2007. ARC continued to develop in 2007-2008 a series of PDC classes and permaculture guilds (Blue Ridge Permaculture Network, www.blueridgepermaculture.net, and Roanoke, VA, in Central/Western Virginia, and Columbus and Grailville, Ohio. The guild in Bloomington, IN joined forces with ARC in 2009 ([email protected]). These classes graduated over 165 full PDC graduates. A web domain, ARCulture.org, was obtained in 2008 and Ann Kreilkamp (Ph.D., PDC ’07, Founder and Publisher of Crone magazine, www.tendrepress.com) joined the board. In 2009, ARC established a “Technological Lending Library” to accept donations and used computer equipment to be lent out to qualified permaculture teachers and developing guilds. Also in 2009, ARC sponsored Permaculture and Local Food workshops in Floyd Co. and nearby Roanoke, VA. In 2009-10, board transitions resulted in Peter and Pamela rotating off the ARC board and replaced by two experienced permaculture teacher/consultants Rhonda Baird (Sheltering Hills Design, Bloomington, IN). Over the past two years we have focused on developing one local Permaculture Demonstration Site, “GANG” (Green Acres Neighborhood Garden) in Bloomington, Indiana. On this site, ARC supported a two-year series of workshops to transform a corner yard into a demonstration and evolving permaculture community food forest and social magnet. To keep current, follow Ann’s very active blog Exopermaculture, or here for Green Acres updates, and the Facebook page for “Green Acres Village and Urban Farm.” A film of a Bloomington Permaculture Guild presentation, “The Evolution of Green Acres Village,” will soon be available on YouTube. 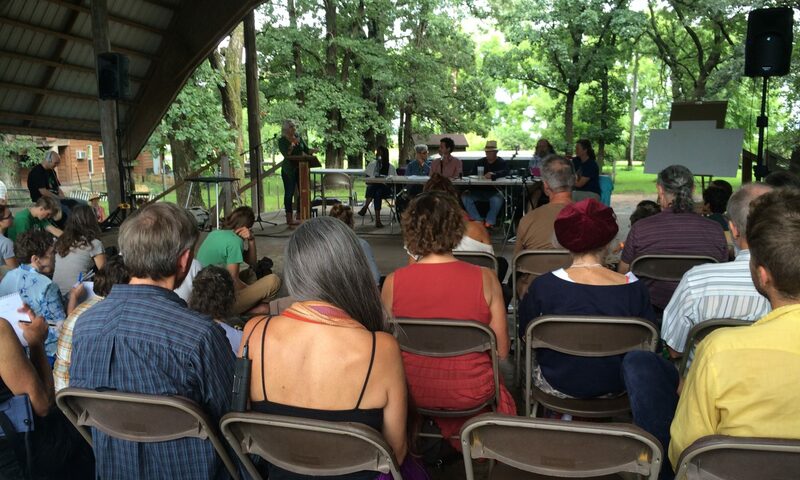 2014 ARC sponsors and board members attended the first North American Permaculture Convergence in Minnesota. Each member was able to contribute to working groups, participate in tours, and offer workshops. At that gathering, ARC also agreed to collaborate with the Permaculture Institute of North America. 2015 GANG garden transitions to a tiny urban farm and CSA for the season of 2016 and the Green Acres Neighborhood Ecovillage project picks up steam. 2016 ARC members attend the second North American Permaculture Convergence in California. One member presents work on community-building and one is part of the organizing team for the convergence.